These are the last two cards I made on World Card Making Day. The first one was for a shaped card challenge. I found this file on this blog and I thought I did everything right but it didn't cut quite right. I used SCAL and it was the first time I'd actually made something with it so I was completely clueless. So I changed it so that it was welded at the shoulders to make a folded card and somehow the parts cut out smaller than they were supposed to but I used it anyway-I thought it still looked ok. The next one was for a sketch challenge. Other than the greeting there's no stamping on it at all. Well, I for one, am impressed! I love your dress card! I still don't have SCAL for fear I will agonize about which is the "perfect" font for my page even more than I do now. :) But then I miss out on adorable dresses! Both cards are so beautiful. I love the dsp on the Thank you card. the dress card is just too cute and the second on looks great too as the DP really makes it. Oh that little dress card is just adorable! Love the second card too! Hi Gale :) Sorry I've been MIA! 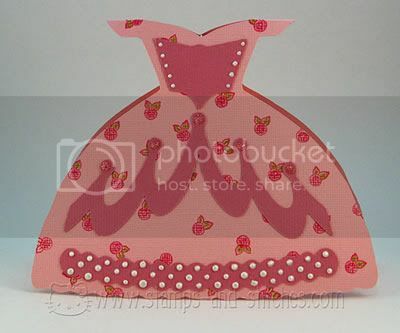 I love both of these cards- the little dress is just darling with those sweet little flowers and the second card is gorgeous, love that paper! Hope all is well! Gale I just love that shaped card! I think you are pretty darn good at using those liquid pearls! I should take lessons from you cuz I have a few bottles and have yet to use them on any of my projects! Love the second card too--I love it when you don't need to dig out a lot of stamps and the paper is so pretty you don't want to cover it up! Gorgeous cards, love the dress, it turned out fantastic. The paper on the lower card is fab, and the bling is a perfect touch. The dress card is PERFECT! I can't see where it's messed up at all! The Liquid Pearls look ok, too! That is something I want to buy and try a few times, Sankari makes them look insanely pretty, so I may try it! LOVE the flower card. Sometimes less is more in the way of stamping, that gorgeous paper is definitely the focal point, and should be! Great cards!